Anyone interested in knowing or sharing—quickly—the demographic basics about any community in the nation will find these U.S. town profiles a go-to resource. We provide content that is similar to that in the popular USA Counties in Profile. The actual numbers and percentages are provided, along with state comparisons to provide context for the community measures. Getting the city or town you want is easy—just type in the name and the “autofill” will provide a pick-list for you to choose—whether you want Chicago or Chicago Heights, Richmond, TX or Richmond, IN or one of the many variations across the country. Download the profile into a Word or Excel file to easily add it to other material you may be collecting. All incorporated cities and towns in the United States. The American Community Survey (ACS) data result from a survey of 3.5 million households nationwide. The 5-year estimates are used for our Town Profiles because it is the only ACS data available for ALL cities and towns, regardless of their population size. And speaking of size, be aware that the smaller the population, the larger the margin of error for the estimate will be. We do not show these margins of error (MOEs) in the profile—but we do want you to know that with any survey-based estimate, there will exist some uncertainty around the estimate. 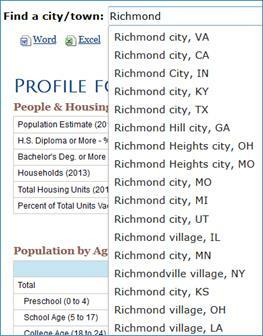 If you have concerns that the estimate you are using for a city or town seems inaccurate, check on the MOEs that are fully published on the Census Bureau’s American Factfinder website. Below is an example of what you can find via that website. And be sure to check out the American Community Survey web page for all you ever need to know about this important resource.